UCMC presents a translation of the article by “Novynarnia” about the peculiarities of Russian justice. Background of the story of the Library of Ukrainian Literature in Moscow is available here. 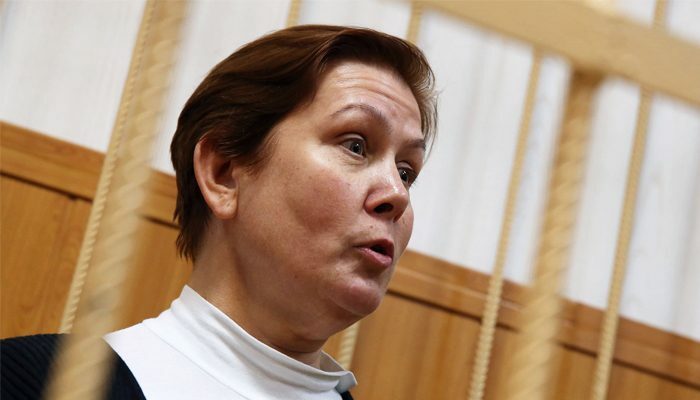 Meshchansky Court of Moscow sentenced former director of the Library of Ukrainian Literature in the capital of Russia Natalia Sharina to four years of probation. On Monday, June 5, it found her guilty of “distributing extremist literature”, reported the correspondent of “Dozhd” from the courtroom. According to Sharina, she was surprised by the verdict and believes the case against herself to be politically motivated. In addition, during the searches a brochure including calls for armed uprise by Ukrainian party UNA-UNSO, banned by the Supreme Court, was allegedly found in the Library of Ukrainian literature. “During the investigation two examinations were conducted – linguistic and psychological. Their results showed that the found literature creates a negative attitude towards Russians and implies hostility between Ukrainians and Russians, ” – explains “Dozhd”. The court dismissed a lawsuit filed by the new management of the Library of Ukrainian Literature accusing Sharina of embezzling 2.1 million rubles. Public prosecution in Sharina’s case asked for a suspended sentence with a “view to Sharina’s past achievements and state of health” (during transportation in prisoner van Sharina had injured her spine heavily). Lawyer Ivan Pavlov asked the court to declare his client not guilty and intends to file an appeal against the current sentence. Natalia Sharina had been under house arrest since October 2015 – at the time she was detained, the building of the Library of Ukrainian Literature was undergoing searches, during which banned literature was found. The time of Sharina’s house arrest – a year and seven months – will be counted as a part of the sentence. According to “Novynarnia“, in August 2016 the court refused to soften Sharina precaution measure. The actual trial began November 2, 2016.